For the first time ever, I made my own mince meat (following old faithful, Delia’s recipe). I didn’t think I liked mince pies. 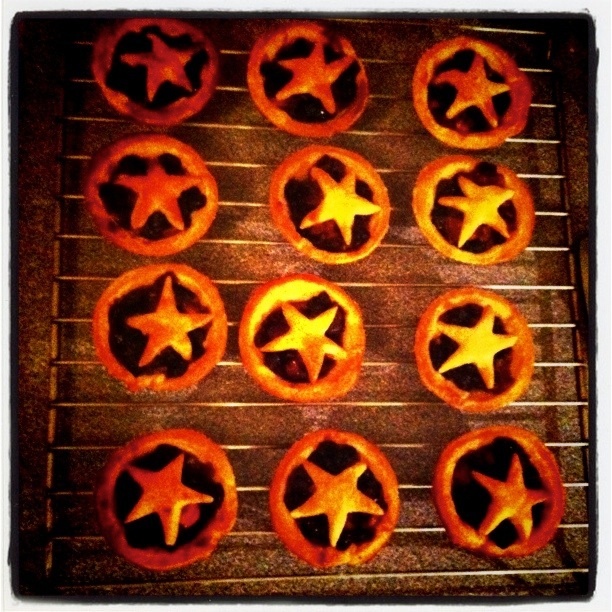 Turns out I don’t like shop bought mince pies. When made from scratch they are a delight (though one is probably enough). I can’t believe I didn’t post this because it was insanely epic. 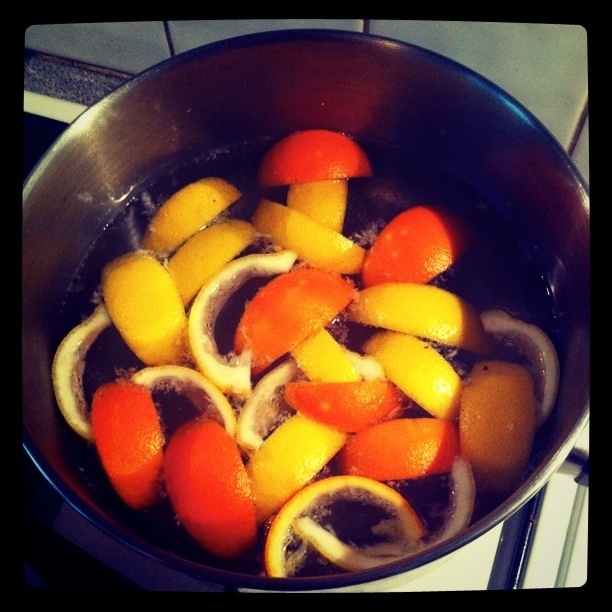 To candy peel you basically have to blanch lemon and orange peel in segments like a million times (leaving to cool between each blanch), then boil in sugar syrup for 45 minutes. The results are quite special, but it took me the best part of a day. After a twitter discussion with @graphic_foodie and @PatrickMcGuigan about the quest for the ultimate panettone recipe, we resolved to all follow a different recipe and see which turned out best. We all made our panettones, but didn’t find time to meet up and compare notes (and breads). And I didn’t find time to write my endeavours up, despite the fact I made it twice. Shame and horror. I followed The River Cafe Classic Italian Cookbook (an excellent Italian cookbook btw) recipe. It was really good. We wondered whether it might be too “cakey” considering it used 2 whole eggs and 7 (yes 7) egg yolks. However, the family at Christmas all declared it to be a triumph, and the Antonio Carluccio panettone was left rather neglected and barely touched (#smug). I believe my mother made bread and butter pudding with the leftovers too! Well, this wasn’t so much a “taste” of Christmas, but just a nice Christmassy idea. 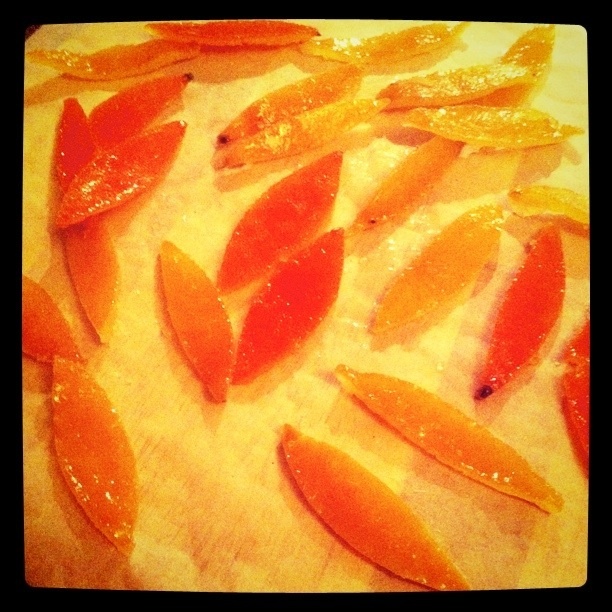 I thinly sliced an orange and dried the slices in the oven at a low temp (around 140°C) for about 4 or 5 hours. I used them to decorate my presents and my homemade chutneys. Made two different types of chutney: cranberry, orange and Christmas spices AND caramalised red onion. Forgot to even take photos of those. Sigh. Embarked on a massive family mission for a completely homemade Christmas feast involving Turkey and Goose, 3 types of stuffing, cranberry sauce, bread sauce, all the usual veg, Christmas pud, Christmas cake, brandy butter AND the prettiest cranberry bakewell tart you ever did see. No pics. MASSIVE FAIL. Had lobster on my Dad’s birthday. 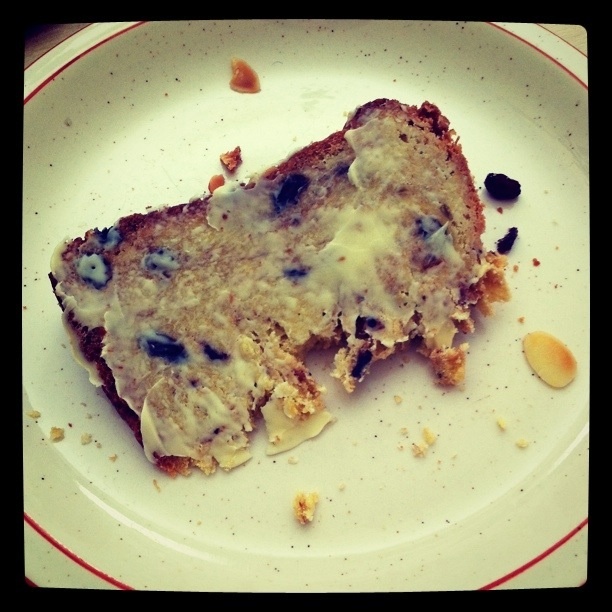 It was good, certainly; but maybe it wasn’t a true panettone. There was no hanging or anything afterall. We’re absolutely delighted to be the recipients of all these yummy Christmas delights. The panettone was extremely impressive, especially now knowing the effort you went to in candying all the fruits – that is going way beyond the call of duty in my book, but well done you! And you didn’t even mention the cranberry Bakewell Tart! Sorry, you did! But it was extremely delicious! 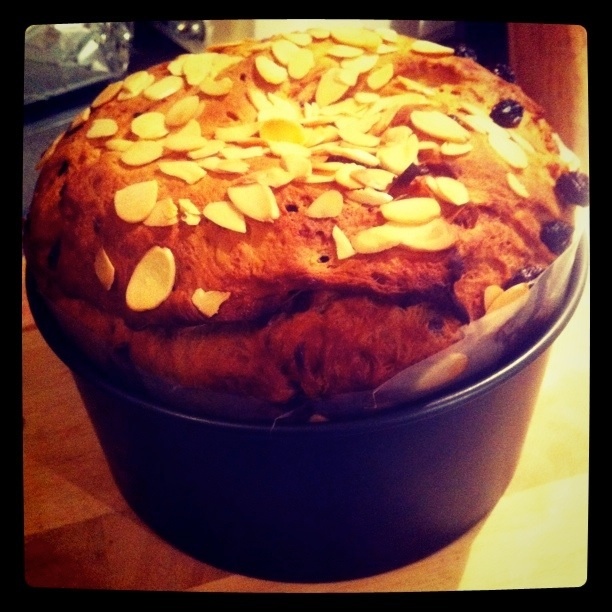 Panettone is on my 2011 to cook list so the River Cafe book shall be my first recipe port of call. It’s a good one I think (though I have never cooked a panettone from any other recipe). I’m a rotten baker too, so pretty easy to achieve. Beautiful pics! And you said you couldn’t bake prettily – not true! 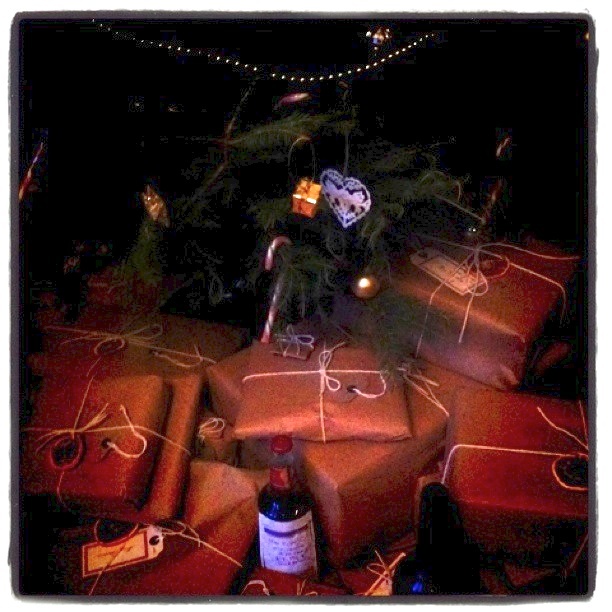 I did have a week off work on my tod (Sven was at work) so I had very little to do apart from bake and wrap pressies. What a lovely week it was too. They look pretty-ish, but definitely still more shabby chic than sophisticated perfection! So funny because I always do things like this. 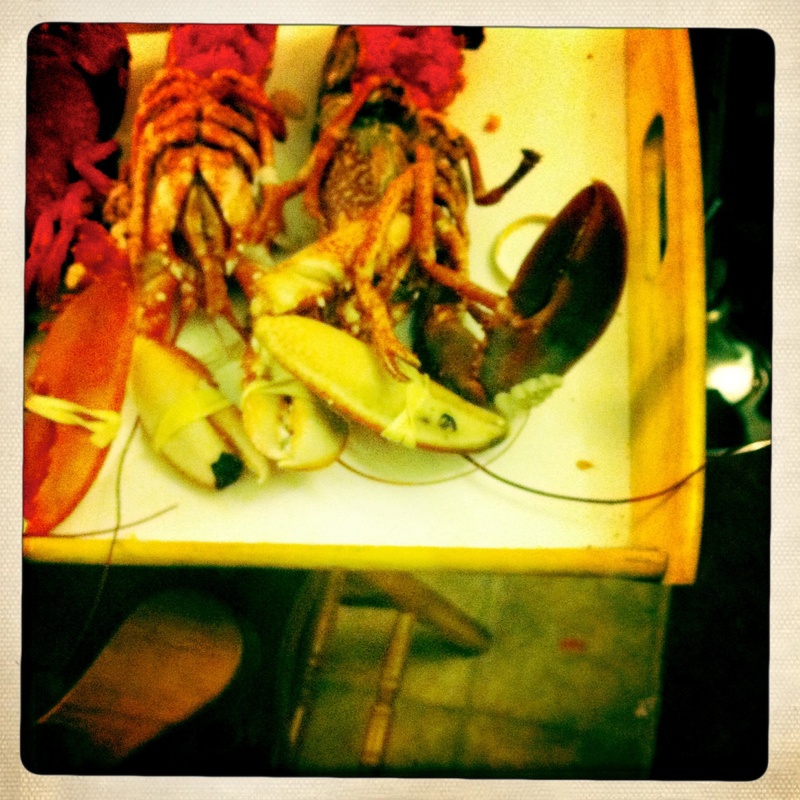 I ate some of the best food of the year over Christmas – did I blog it no! Was too busy eating and enjoying it. Oh well. I had SO MUCH PLANNED for pre-Christmas and had the week before off work and everything but then I got the flu and instead spent all week and Christmas itself confined to a germy limbo. Hugely impressed that you managed all this though, especially as MiMi says whilst pregnant! 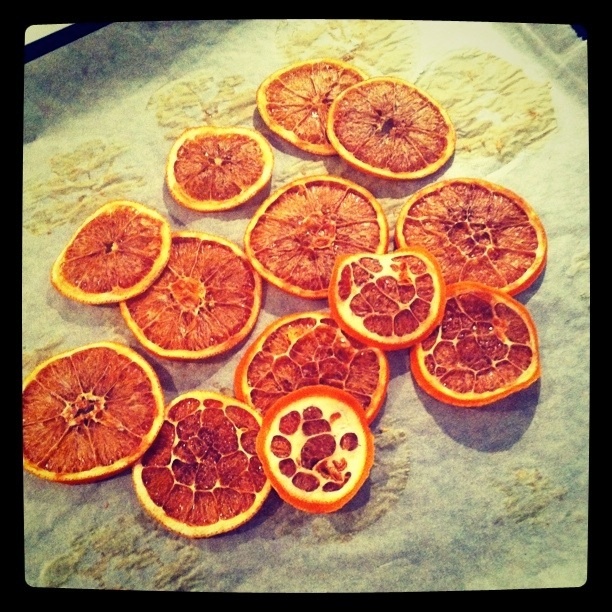 I love the dried orange slices, might have to do some of them myself next year to decorate the tree. all food look so delicious, can i be invited to taste the food next time? I also love your photo style, so artistic!